Thanks to You…We Won the Bank Enterprise Award! 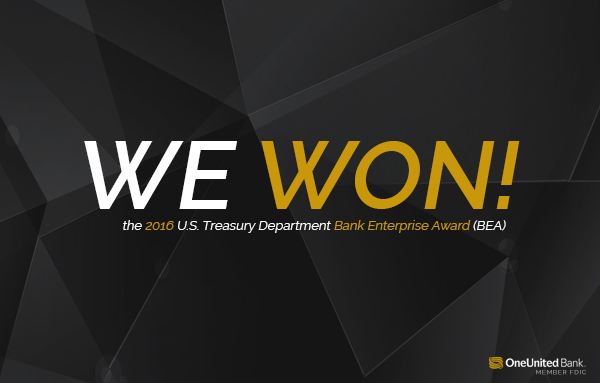 We are honored to announce that we won the U.S. Treasury Department’s 2016 Bank Enterprise Award (BEA) for our community development lending. This marks the 11th time we have received this award. We want to thank all of you for your support! This $227,000 award will support our mission to serve urban communities and foster financial literacy. We are honored by the recognition of our community development efforts. Now we are focused on increasing the rate of Black homeownership by expanding our home loan programs and supporting affordable housing in low to moderate income communities with our multifamily loan programs. Recently, we partnered with the Massachusetts Affordable Housing Alliance (MAHA) in a Facebook Live event, #BuyTheBlock, to promote first time home buyer’s programs and home ownership. The BEA program is administered by the U.S. Treasury Department’s Community Development Financial Institutions (CDFI) Fund and provides an incentive to FDIC-insured banks to expand the availability of credit, investment capital and financial services in distressed urban and rural communities. These awards complement the community development activities of an elite group of certified CDFI banks and thrifts by recognizing their support of distressed communities. Awards are provided on an annual basis, and eligible institutions must comply with the rigorous requirements of the program and submit an application for consideration. The CDFI Fund recently announced it has awarded over $18.6 million dollars in BEA grants to 102 banks across the country, which increased their loans and investments in distressed communities by $285.5 million. Thank you again…we’re marching on! Was this for 2016 or 2017? I would like to still get me a pay card. Nobody has contacted me back yet. Congratulations One United Bank. I'm happy to be a part of this moment! Spirit brought me to the right Bank for my accounts. God bless you all. Proud of you, look forward to working with you in the future. Excellent n Congrats!!! I've been lurking you guys for awhile, and with a new job, I'm looking fwd to becoming a mentor. Hope you're up for refinancing and/or HELOCs! Congratulations One United, we can do anything as Black folks when we pool our resources!